People have asked if we have big plans for spring break, which we are currently in the middle of. Are we planning on loading seven children onto an airplane or better yet cramming them tightly into a car, driving for hours on end to visit some magical place down south or up north? Nope, we sure aren’t planning something as delightful as that idea sounds, but we do have some big plans unfolding nonetheless at the Ronne homestead. I am finally getting a laundry room! This has actually come out of pure necessity rather than a planned event. 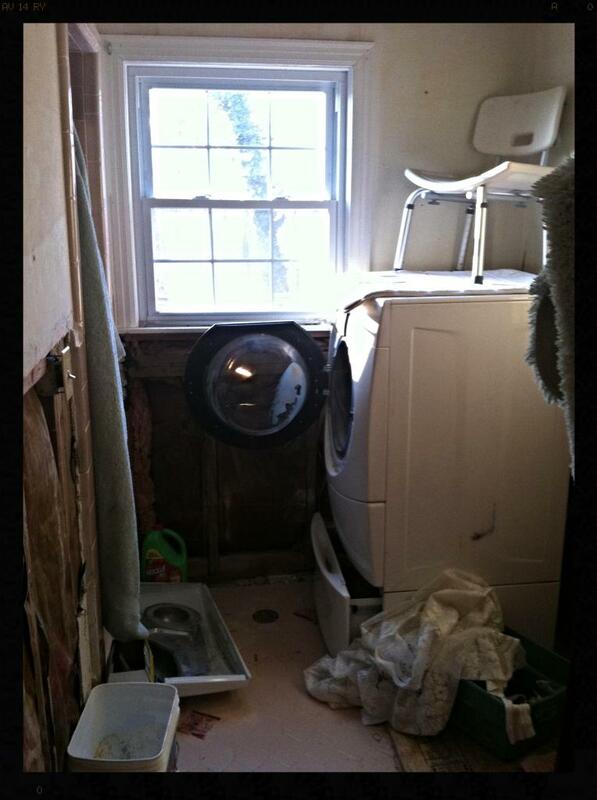 I had a washing machine and a dryer stuffed into what used to be a bathroom until my dryer suddenly died on February 13, 2014. We have no idea what happened to the dryer and after numerous attempts at trying to fix it, my husband gave me the green light to buy a new one. That led to the green light of buying a new set because the washing machine hasn’t sounded real healthy either for the past few months. In the meantime, we have been laboriously hanging our clothes in 40 degree weather. Honestly, I enjoy hanging clothes, it’s a relaxing practice, especially when the sun is out, and I have an excuse to occasionally step outside throughout the day. However, I do not enjoy crispy clothes, especially crispy jeans or crispy towels. A nice, hot shower after a long, tedious day, only to be wrapped in a hardened towel is not exactly how I imagine the best day ever. But, I have been thankful my washing machine has continued working so I didn’t have to employ a washtub and brush like our ancestors. My generous, fabulous husband has put my laundry room at the top of his renovation schedule. It has been a super fun journey already, as is everything we put our minds and agendas to. We were so excited to discover this beautiful, slate blue washing machine and dryer pair at Lowes clearanced out as the last floor models. We bought them, without much thought, and then once home realized our electric hookup wasn’t going to work real well with our new gas dryer. That beautiful pair went back, much to my dismay. But…. the same day, approximately 2 minutes later, I discovered this pair, a bigger pair, a white pair, a more options with decorating pair, a pair that was the exact same price as the pretty blue pair. We took them as I whispered convincingly to my husband that I must be a dream wife to shop for appliances with as it took me literally two minutes to make the life changing decision (sometimes as wives we need to point out our obvious strengths). He agreed with a happy smile etched upon his face. Here is our new pair….